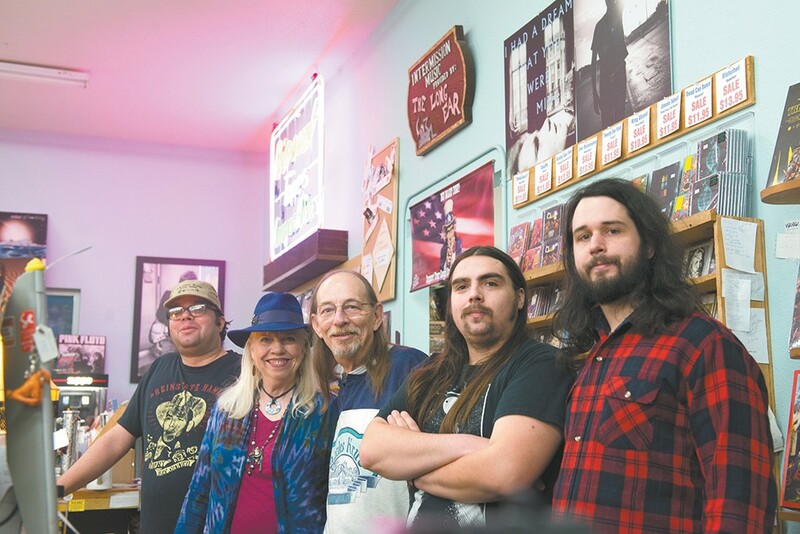 Husband and wife Deon and Terry Borchard (second and third from left) opened the first Long Ear record store in 1973, and they're celebrating its 45th anniversary on Saturday. In 1973, Terry and Deon Borchard opened a record store, the Long Ear, in the small town of Big Bear Lake, California. That was 45 years ago, which, Deon is quick to point out, is also the revolutions per minute of those old vinyl singles. It wasn't until 1985 that the Borchards packed up shop and moved to Coeur d'Alene, where they've now been for 33 years. Just like the RPM of a standard LP. Music has obviously dictated the Borchards' lives, and in celebration of their milestone, we strolled down memory lane with them and looked back at the Long Ear's history, using their various locations and the changes in the music industry as signposts. The first major release after the Borchards got into the record business was Elton John's double LP Goodbye Yellow Brick Road. It was a blockbuster album, the kind everyone just had to own, and in the days before streaming, record stores were a destination point. "You used to have to work to listen to your music a little more," Terry says. "It was a big deal to run down to your local record store and get an album you'd been salivating for," Deon says. "You take it home, you light the blue candle, you turn out all the lights in the house, you sit on your waterbed. You put the stylus down on the new record, and you listen. You don't talk. You listen all the way through." Terry remembers driving to an L.A. supplier every week, buying up all the shiny new format he could. There weren't all that many CDs at the time: Some of the first titles the Long Ear stocked included Willie Nelson's Stardust and J.J. Cale's Grasshopper. "There weren't a lot available," Terry says. "Same as with any format, they were looking to see if it'd fly." What they didn't do was fly off the shelves. At least not at first. "We carried CDs for about six months before we sold one," Terry says. As the Borchards moved to their first Idaho location, CDs had finally caught on, but it was cassette tapes that really ruled the market. "We had a whole wall of cassettes, and that was the preferred music medium because of portability," Terry recalls. "You'd give [a customer] the little cassette player and he'd put those earbuds on, and it was an instant smile." The inventory at Coeur d'Alene's the Long Ear. For about a decade, the Long Ear didn't sell vinyl at all. Nobody was pressing it, and demand for used wax was practically nonexistent. 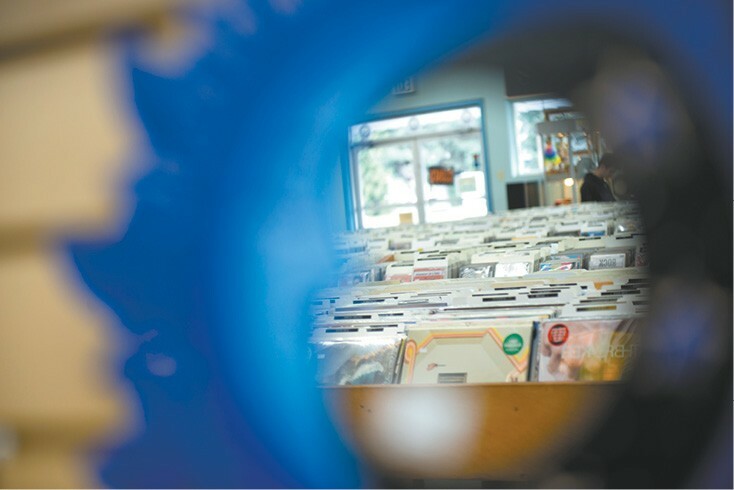 But seven or eight years ago, the tides shifted, and though CDs accounted for most of the Long Ear's sales, more customers were bringing in used vinyl to sell, and new vinyl is en vogue again. "There's a lot of people that never stopped buying vinyl," says Joel May, the Long Ear's resident vinyl expert. "It's a more physical product. A lot of younger people are getting into it because it's something to hold onto." And what are the most common records in those used boxes? "Lately it's been Souvenirs by Dan Fogelberg," May says. "I don't know why. I've seen that in every collection I've pulled in the last month. Before that it was Silk Degrees by Boz Scaggs." After their previous landlord sold the building where they'd been for 15 years, the Borchards moved their shop to a slightly larger space on Government Way. "This has been a real good move for us," Terry says. "We're really comfortable in this building. We're planning on being here for awhile." Most of the regulars from the old shop have followed the Borchards to the new one, as have the employees, including manager Nic Fritze, who recently celebrated a milestone of his own: He's been with the Long Ear for 20 years. The Long Ear is celebrating its 45th anniversary on Saturday, Nov. 10, 10 am-8 pm. New vinyl will be 33 percent off, and new CDs 20 percent off. All other inventory — including used records and CDs, posters, clothing, household and novelty items — will be 45 percent off, and the store will also be offering prizes and other giveaways. The original print version of this article was headlined "MUSIC | ANNIVERSARY Memories of Music"